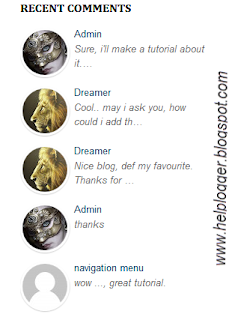 In the past tutorial, I've shared a simple Recent Comments widget, now you have the option to add a stylish Recent comments widget with round avatars, which comes along with comment excerpts. You also have the option to change default Anonymous Avatar Image. Step 1. Go to Blogger Dashboard, then go to Layout and click on Add a Gadget link. Replace your-blog with the name of your blog. Step 4. After you've made the changes, click Save... and you're done!